In 2005 we were asked by Nuffield Place, at that time owned by Nuffield College, to clear out invasive holly from the beech wood behind the house and garden. The public footpaths through the wood were getting overgrown and the holly was shading out woodland floor flowers like bluebells. We completed this project over several sessions. We then moved to the walled garden, which in Lord Nuffield’s time had supplied vegetables for the house. After his death it went out of use and was grassed over. 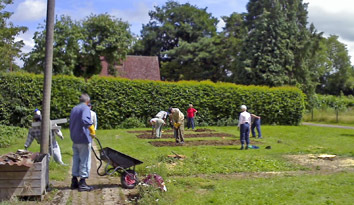 In 2007 we cut the turf and dug out new beds in preparation for a vegetable growing project for disadvantaged youngsters. We returned in 2010 after Nuffield Place was acquired by the National Trust. One of our tasks was to cut down areas of badly overgrown rhododendron and holly patches at the edge of the woodland. Another was to set large pre-cut logs into the ground in an interesting sequence for children to play on. We have also raked hay in a wild flower-rich meadow. 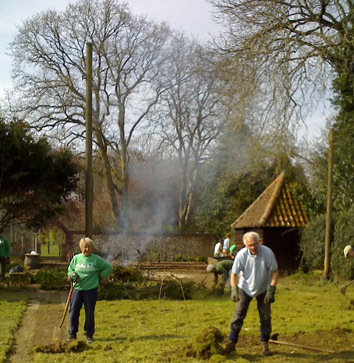 Nuffield Place has its own group of outdoor volunteers, but we continue to work there when called upon. Nuffield Place if off the A4130 Henley to Wallingford Road. We park in the driveway.